Although unlikely, it is possible that rates of climate change and sea-level rise will exceed likely estimates. This low probability but high-consequence risk needs to be borne in mind by coastal managers seeking to adapt to climate change. There is a low probability but high consequence risk that the estimates of global temperature increase and sea-level rise, even for the high emissions scenario RCP8.5, are too low. Scenarios of rapid sea-level rise are based on melting of land-based icesheets, especially the unstable West Antarctic icesheet which, if it melted totally, would lead to sea-level rise of six metres over several centuries. One mechanism by which temperatures could increase more rapidly than anticipated involves melting of Arctic permafrost and release of methane trapped in the frozen soil. Methane is a very powerful greenhouse gas. Coastal managers will plan for the likely outcome, but bear in mind the possibility that rates of change may be greater than the current best estimates. The Intergovernmental Panel on Climate Change (IPCC) in its assessments provides estimates of future climate change and sea-level rise that it labels as ‘likely’. For example, the IPCC Fifth Assessment tells us that, by 2081-2100, sea level is likely to have risen by 45-82 cm and global temperature by 2.6-4.8oC for a high greenhouse gas-emissions future (our current pathway). For a low emissions scenario, the equivalent numbers are 26-55 cm for sea-level rise, and 0.3oC-1.7oC for temperature (IPCC 2013). ‘Likely’, in IPCC parlance, means that there is 66% confidence in these estimates. 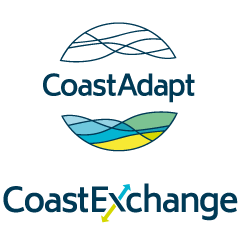 Most of the information and guidance in CoastAdapt is based on such average or likely estimates. However, there is a chance that what actually happens lies outside the likely range. Statistically, there is a 17% chance that the changes will be above the likely range. Or, it may be because the models on which these estimates are based do not capture all the processes at work in the Earth-atmosphere-ocean system. For example, the sea-level rise estimates in the IPCC Fifth Assessment do not fully take account of the possibility that land-based ice sheets, such as the Greenland ice-sheet, may undergo rapid melting due to dynamical effects. Here we consider the possibility that climate change may produce warming and sea-level rise that is greater than the likely estimate of the IPCC. In risk terms, these are low probability but high-consequence events that, because of their potentially devastating impacts, cannot be ignored. Coastal managers charged with making adaptation decisions will plan for the likely outcome, but bear in mind the possibility that what eventually happens may be more severe – that abrupt climate change may occur. Collapse of the West Antarctic icesheet has the potential to lead to rapid and large increases in sea level—as much as 3 m over a few centuries. Total loss of the ice sheet would lead to sea-level rise of 6 m. The West Antarctic icesheet is fundamentally unstable because the base of the ice sheet rests on ground below sea level, exposing it to potential incursions of warm sea water causing melting and retreat. A good explanation of the processes involved can be read at http://www.nasa.gov/jpl/news/antarctic-ice-sheet-20140512/#.VvoaYT_fri9 (accessed 9 May 2016). 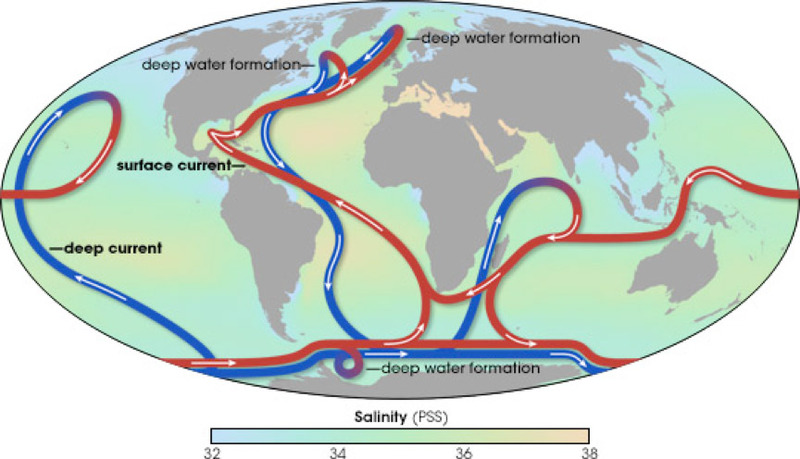 Collapse of the thermohaline circulation. This is the salt and heat driven circulation of the ocean, shown in Figure 1. Melting ice from Greenland could, by injecting large amounts of freshwater into the North Atlantic, cause this circulation to weaken or even shut down. The observed failure of the North Atlantic to warm (see Figure 2 in Global climate change) could indicate that this is already starting to happen. The consequences are unclear but are likely to include cooling and increased storminess over land masses around the North Atlantic. This is the storyline in the 2004 film ‘The Day After Tomorrow’ although the film depicted an unrealistically extreme version of the impacts. Elsewhere, and with less certainty, the effects might include collapse of plankton stocks with knock-on effects up the food chain, more frequent and more intense El Niño events (an outcome which may eventuate anyway, independently of thermohaline circulation collapse), and warming over the Tropics and Antarctica. Methane release from permafrost. Methane is a much more effective greenhouse gas than CO2. The reason you don’t hear as much about it is because there is much less of it in the atmosphere, but each molecule of methane is 25 times more effective at trapping heat than CO2. Large amounts of methane from decay of organic matter are trapped in the permafrost – the deep frozen soil layer below the Arctic tundra. The concern is that, as global warming progresses, the permafrost will melt, releasing methane and leading to accelerated warming of the atmosphere. Other potential causes of abrupt climate change include the Arctic becoming ice-free even in winter, the Amazon rainforest dying off and the total disappearance of permanent snow and ice cover on the Tibetan Plateau. With the exception of the collapse of the thermohaline circulation, they have the potential to impact severely on the rates of global temperature increase and/or sea-level rise, causing them to increase more rapidly than rates regarded as likely by the IPCC. Figure 1: The large-scale circulation of the oceans, known as the thermohaline circulation. Source: Riebeek 2006 © NASA. Article in The Conversation, December 2015 by Sybren Drijfhout “What climate ‘tipping points’ are – and how they could suddenly change our planet”: http://theconversation.com/what-climate-tipping-points-are-and-how-they-could-suddenly-change-our-planet-49405 (accessed 9 May 2016). IPCC, 2013: Summary for Policymakers. In: Climate Change 2013: The Physical Science Basis. Contribution of Working Group I to the Fifth Assessment Report of the Intergovernmental Panel on Climate Change, T.F. Stocker, D. Qin, G.-K. Plattner, M. Tignor, S.K. Allen, J. Boschung, A. Nauels, Y. Xia, V. Bex and P.M. Midgley, Eds., Cambridge University Press, Cambridge, United Kingdom and New York, NY, USA. Accessed 9 May 2016. Available online at http://www.ipcc.ch/pdf/assessment-report/ar5/wg1/WG1AR5_SPM_FINAL.pdf]. NASA, undated: Earth Observatory – Global Conveyor Belt. Accessed 9 May 2016. [Available online at http://earthobservatory.nasa.gov/Features/Paleoclimatology_Evidence/paleoclimatology_evidence_2.php]. Riebeek, H., 2006: Paleoclimatology: Explaining the evidence. Earth Observatory NASA. Accessed 13 May 2016. [Available online at http://earthobservatory.nasa.gov/Features/Paleoclimatology_Evidence/printall.php].